Visual Similarity Duplicate Image Finder 6 Can Find Similar And Duplicate EXIF Tags Like Description, Comment and Camera Model. VSDIF has proven over the years as the best tool for finding similar and duplicate images. Its flexible scan modes, filters, auto-check and settings make it suitable for a vast variety of tasks. 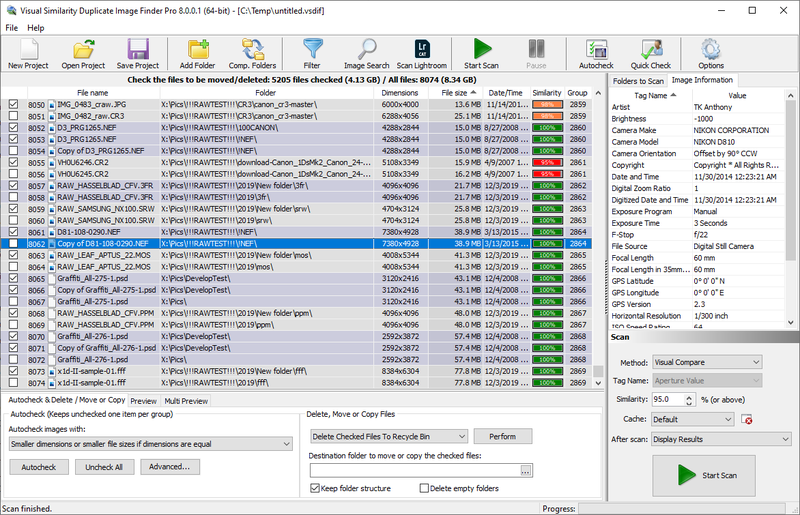 This new major release adds another powerful scan method to the already vast arsenal of the tool. Though this is a very nice new feature, the improvements do not end there. A “Multi preview” makes it easy to compare the images if there are more than two duplicates in a group. The flexible new panel lists all the duplicate images at once and provides options for customizations. The new scan method makes it possible to find and group together photos that have similar and duplicate EXIF Tags. The ways this feature can be used are limitless as it works on all the available EXIF Tags. While the most common use would be to search for similar and duplicate comments or descriptions the feature may also be used to search for duplicate camera model in order to find all the photos shot with a certain type of equipment. Searching for duplicate EXIF Date can reveal all the photos from e certain photo shootout. This release includes a new preview panel that lists all the duplicate photos in a group together. The panel can be resized to order the thumbnails in a single or multiple rows and the thumbnail size can be altered using the mouse wheel. The thumbnails also include a check-box in order to denote the photo’s checked state and also can be used to toggle that state. In some cases it may be more convenient to preview two images at a time so the old preview panel is preserved in the new release. It can still be used if one prefers to see a larger preview of the selected items. An improvement now automatically adjusts the orientation of the previewed image if such information exists in the EXIF data. There are plenty of new features and improvements in this release. Some of the more important ones is the fact that the EXIF tags list is now sorted by tag name by default and the sort order can be reversed by clicking the column title. DICOM tags – files used in the medical industry are now supported in the Corporate version of the tool. Another improvement now makes it possible to preserve the order of the duplicate groups for multiple save/load sessions. This is especially handy while working with large projects where a user analyses a bunch of groups and wishes to continue later with the rest. And of course as always please comment below if you miss a feature or you have a suggestion for improvement. We will be glad to hear from you! This entry was posted in Visual Similarity Duplicate Image Finder and tagged Bike EXIF, EXIF Data Gps, EXIF Data Location, EXIF Data Reader, EXIF Data Software, EXIF Freeware, EXIF Photo Data, EXIF Reader Software, EXIF Search Engine, EXIF Search Software, EXIF Software Free Download, EXIF Statistics, EXIF Tag, EXIF Tag Editor, EXIF Tag Names, EXIF Tag Viewer, EXIF Viewer, EXIF Viewer Software, EXIF Web Search, Find Duplicate EXIF, Find Duplicate EXIF Data, Find Duplicate EXIF Tags, Find EXIF Comment, Find EXIF Data In Photoshop, Find EXIF Data On Facebook Photos, Find EXIF Data On Iphone, Find Similar EXIF, Find Similar EXIF Data, Find Similar EXIF Tags, Flickr EXIF, Get EXIF, How To Look Up EXIF Data, Remove EXIF Data, Search EXIF Data Flickr, Search Flickr By EXIF Data, Search Using EXIF Data, View EXIF On Flickr on April 1, 2015 by MindGems Support.